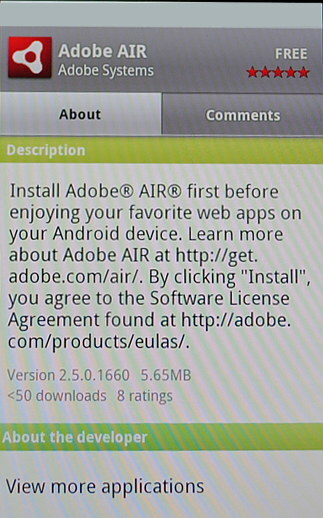 As planned for 8th October, Adobe Air is available on the Android market. An app that keeps to the estimated date? No way! Best of all, Air apps are available like any normal app on the marketplace. So developers don't need to use a special place to sell their apps. Great thing. Is it necessary to point out that you need Android 2.2 for it? Cross-platform apps, here we come!